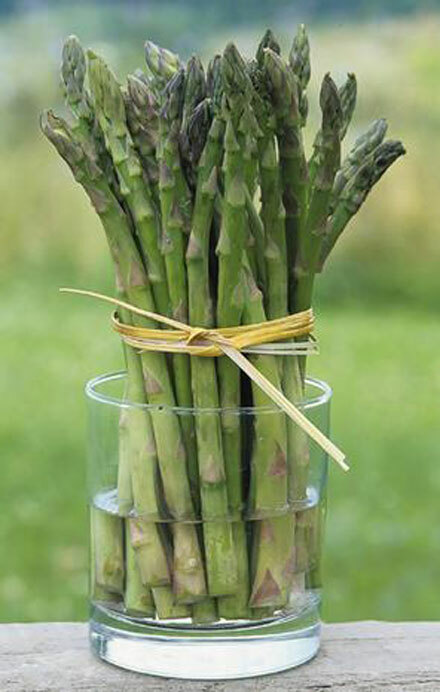 Chop the asparagus into 1 inch lengths, reserving the tips for garnish, place asparagus in a heavy bottomed pan, add chicken bouillon and salt and just cover with water. Bring to the boil then transfer to a blender, being careful not to overfill, and blend till smooth, check seasoning and correct if required, cool. Roll the poached eggs lightly in the flour, shake off excess, mix the egg with a little milk in another container and roll the eggs in the mixture, finally, roll the eggs in the breadcrumbs, making sure they are well coated. Heat a deep fat fryer to 180c. Gently heat the soup, arrange the garnish in the bottom of four warmed soup bowls, deep fry the eggs until crispy and browned, season and place on top of the garnish, pour the warmed soup around the egg and serve.